There’s something happening here, and what it is is becoming clearer: A shift in the overall partisan make-up of Wisconsin’s voting population toward Republicans. Joan Biskupic says her fourth book about a member of the United States Supreme Court involved “my most difficult subject” – Chief Justice John Roberts. But, perhaps in good part for that reason, it is also attracting much attention. Roberts is “a very reserved individual,” Biskupic said during an “On the Issues with Mike Gousha” program in the Lubar Center at Marquette Law School on Tuesday. “There’s a lot that you see, but much more that’s held back.” She had the benefit of eight interviews, covering more than twenty hours, with Roberts, but she said she wonders still about what is not known about him. However, Biskupic’s newly-published biography, The Chief: The Life and Turbulent Times of Chief Justice John Roberts, does offer a lot, some of it not reported previously, about Roberts, who has been chief justice since 2005. And in addition to a richly detailed description of Roberts’ life, the book breaks new ground in describing how Roberts came to be the decisive vote in upholding the constitutionality of the Affordable Care Act, often known as Obamacare, in 2012. Biskupic describes how he initially took positions opposing the constitutionality of the law during the court’s work on the case, then switched his views. Coupled with an understanding of the seriousness of the issues, there was a sense of overall hopefulness at a conference on March 22 at Marquette Law School on youth mental challenges, including bullying and suicide. An audience of about 200, many of them people who work with young people with mental health issues, heard that hopefulness not only from the professionals who spoke, but from a panel of four students who deal personally with mental health issues. Soledad O’Brien remembers a girl in her high school on Long Island, New York, who broke a front tooth and went for many months without getting it fixed. O’Brien grew up in a stable, comfortable home and never had to worry about shelter, food, medical care, or other valuable parts of stable living. And she never gave much thought to why the girl didn’t get her tooth fixed. But the girl and her front tooth are still on her mind decades later. That girl makes her think about all the young women, then and now, who live unstable lives, who can’t meet daily needs that are met without much thought in other homes. “I was so naive and stupid about those things,” O’Brien said during an “On the Issues with Mike Gousha” program at Marquette Law School on Tuesday. Maybe it’s not fair to reduce to a few points an hour of conversation with Reggie Moore, director of the City of Milwaukee’s Office of Violence Prevention, at an “On the Issues with Mike Gousha” program at Marquette Law School on Feb. 6. But let’s hope it’s a way to drive home a few of his major points and perhaps to encourage you to watch the video of the program. Moore’s effort is best known for the document it produced, “The Milwaukee Blueprint for Peace.” It offers goals and strategies aimed at reducing violence in the city, many of them dealing with community development and investment. “Every strategy in the blueprint is evidence based,” Moore said. The bald eagle symbolizes the strength of the United States, not least when the country uses its military power. 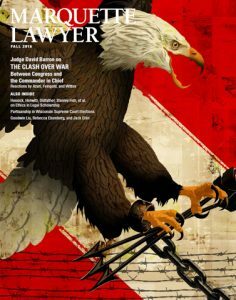 The eagle on the cover of the Marquette Lawyer magazine, Fall 2018 issue, shows the determination, even the fierceness, of the eagle during times of war. But the process involved in deciding where and how that eagle flies is more complex than many people may realize. In the cover story in the new Marquette Law School magazine, David J. Barron, judge of the U.S. Court of Appeals for the First Circuit and formerly a Harvard Law School professor, insightfully examines three chapters in American history when a president and leaders of Congress had differing positions on use of power. Barron focuses on three of the nation’s most revered presidents: George Washington, Abraham Lincoln, and Franklin D. Roosevelt. The article is an edited and expanded version of the E. Harold Hallows Lecture that Barron delivered at the Law School in April 2018. To read the article, click here. Interspersed throughout the article are reactions by three individuals with different perspectives on the relationship between Congress and the commander-in-chief: Russ Feingold, former three-term U.S. senator from Wisconsin and currently distinguished visiting lecturer in international studies at the University of Wisconsin–Madison; Julia R. Azari, associate professor of political science at Marquette University and a scholar of the American presidency; and Benjamin Wittes, editor in chief of Lawfare and senior fellow in governance studies at the Brookings Institution. In 2007, with President George W. Bush’s second term as president coming to an end and Vice President Richard Cheney not aiming to succeed him, open races for both Democratic and Republican nominations for president were developing. Bill Adair thought it was time to bring more fact-checking into American political journalism. Adair, then a Washington-based journalist with the St. Petersburg Times (now the Tampa Bay Times) began a project that the newspaper called Politifact. The idea took off and, more than a decade later, PolitiFact and other political fact-checking efforts have become an important part of the national journalism landscape. PolitiFact is now an independent non-profit organization. The Milwaukee Journal Sentinel became a partner with PolitiFact in 2010, ahead of the election that year in which Republican Scott Walker defeated Democrat Tom Barrett for governor, and continues to run PolitiFact pieces, with either national or local focuses, almost every day. “When does the sentence end?“ Albert Holmes says he often faces that question as he works to help people who have been released from incarceration and who are re-entering the general community. Holmes, president and CEO of My Father’s House, was one of the speakers Thursday, Oct. 4, at a conference at Marquette Law School that focused on what can be done to provide paths for more people in those situations to establish stable lives. You can’t build a home from the roof down. You have to start with the foundation and build upward. And that’s what Keith Posley, interim superintendent of Milwaukee Public Schools, is stressing in the early months of leading Wisconsin’s largest and most challenging school district. Educators often get caught up in new programs and ideas for education that sound appealing, Posley said during an “On the Issues with Mike Gousha” program Wednesday at Marquette Law School. But education – and building greater success for MPS – needs to be start with teaching the basics so that all students learn to read, write and do math early in their school years. Add to that building good school attendance and the ability to work well with others and you have grounds for a bright future for kids and for MPS, Posley said. Posley offered Gousha, the Law School’s distinguished fellow in law and public policy, and an audience of about 200, including many key figures in education in Milwaukee, an optimistic vision of what lies ahead for MPS. “Milwaukee Public Schools is alive and well and we’re going to do great things,” Posley said. “Give me five years,” Posley said, and MPS tests scores in reading and math will be above the state average. Maybe it can be done in three, he added. Overall, MPS scores as of last year were far below state averages. Posley proposed to the School Board during its budget work in the spring that large cuts be made in the central administration of MPS rather than cutting budgets in schools. Posley said he did that because “if we’re going to make a change, it’s going to happen in the classroom.” He said, “I have to put every ounce of money we have – I put 89 cents of every dollar we have — in the classroom.” His goal for next year is to raise that to 90 cents, he said. Concerns were raised in a recent report from the Wisconsin Policy Forum about the long-term financial picture for MPS. Asked about that, Posley said MPS could use more money, but he would not be deterred by finances. “I’m going to make it happen with whatever I have,” he said. What will he do if MPS gets fresh revenue in upcoming state budgets? “I’ve created a wish list already,” he said. The list, he said, includes reviving an effort of about a decade ago called the Milwaukee Math Partnership and doing more to strengthen offerings for children from birth to five. Posley grew up in a small town in Mississippi and was recruited for a teaching job in Milwaukee almost three decades ago. He said he expected to stay in Milwaukee for one year. But he loved working in schools and advanced from being a teacher to an assistant principal to a principal to a series of administrative positions before being named to head the system. His willing to make a long-term commitment to this job? “Mike, this is home,” he said. “Mississippi is in the rear-view mirror.” Posley wants to drop the word “interim” from his title, a step the Milwaukee School Board is likely to take soon. He certainly is not acting like someone who intends to fill the job for a short time. “I have the steering wheel now, and I’m driving,” Posley said. To view the one-hour video of the program, click here. Two experts on the United States Supreme Court expressed concerns Thursday during an “On the Issues with Mike Gousha” program at Marquette Law School that the level of partisanship in confirmation processes for justices is causing damage to the court itself. Strauss said, that, even though partisanship has long been a part of confirming court nominees, among senators overall, “there was a consensus that we really have to kind of make sure that we take care of the court.” That meant approving well-qualified candidates who would be respected and do their jobs well, with less attention paid to their partisanship. That has eroded, he said. Ed Flynn was a complete outsider to Milwaukee. The city’s police chief from 2008 to 2018, he never lived in Milwaukee before he became chief, he left Milwaukee as soon as he was done, and some people questioned how much he was connected to the life of the city as a whole while he was serving as chief. Alfonso Morales, Flynn’s successor, is a complete insider to Milwaukee. Born in the city, grew up on N. 33rd St., graduated from Milwaukee Tech High School, as it was then called (it’s now Bradley Tech). After graduating from Carroll College, he became a Milwaukee police officer and rose through the ranks until he was named chief in February 2018.